Identification. Wallis is named after the eighteenth century English explorer Samuel Wallis. Some people call the island East 'Uvea to distinguish it from an island off the east coast of New Caledonia, known as West 'Uvea, which was settled two hundred years ago by people from East 'Uvea. The population is of Tongan ancestry. Futuna was called the Hoorn Islands by Dutch explorers. Futuna includes the nearby uninhabited island of Alofi. Location and Geography. The island of Wallis lies in the central Pacific. It is a raised reef, mainly limestone, with an area of ninety-six square miles (250 square kilometers). It is surrounded by a wide lagoon with many small islets. There are no rivers but several lakes in the interior plateau. Better soil is found on the coastal rim, where large trees and crops are cultivated. The villages are in this coastal region, predominantly on the eastern side. The western side is uninhabited; several of the larger islets are inhabited. The lagoon is shallow, and barely navigable. The island is divided into three districts. Mu'a, the most populous; Hahake; and Hihifo. The main town where government offices and the hospital are located is Mata'utu in Hahake in the central district. 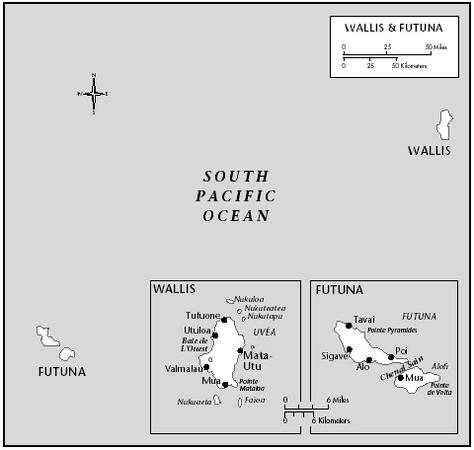 Futuna lies one hundred miles southwest of Wallis. Futuna and Alofi are volcanic islands. Futuna is twenty-five square miles (64 square kilometers), and Alofi is eleven square miles (28 square kilometers) in area. A narrow reef encircles both islands, but there is no lagoon. People cultivate the hillsides and use the banks of streams to grow taro. The island is divided by several major rivers, and the population lives in the southern coastal zone. The island is divided into two kingdoms: Sigave in the west and Alo in the east. Leava in Sigave is the main town and port. Demography. The population of Wallis was 8973 in 1990, and in 1995 was estimated at 9,500. The population of Futuna was estimated at 5,000 in 1995. Similar numbers of Wallisians and Futunans live in New Caledonia. On Wallis, the population lives on the eastern side of the island in communities near a Catholic church. Europeans, mainly French administrators and teachers, account for about 3 percent of the total population. Linguistic Affiliation. The 'Uvean language is a Western Polynesian language closely related to Tongan. Wallisians use 'Uvean as their everyday language. All school-age and older persons also speak French, the language of the administration. A few people also speak English. The Futunan language is of Samoic origin. It is the language of everyday life, though French is used on official occasions and is taught in schools. Symbolism. The kava bowl and tapa cloth are important symbols of both cultures. Kava is drunk both ritually and secularly in Futuna. The kava bowl is used to honor chiefs and the existing hierarchy. Tapa cloth is made by women for exchange at rituals that draw extended families together. It is symbolic of women's wealth, along with specially scented oil. Tapa is also sold to tourists. Food gifts are symbols of welcome and good will. The malae , or meeting ground, is a place where people gather to honor their chiefs (kings in Futuna). The Lomipeau canoe represents the ties between Wallis/'Uvea and the early maritime empire of Tonga of four hundred years ago. It also symbolizes the strong seagoing tradition of these people, particularly their journeys to Tonga, Samoa, and other islands. Tonga and shared its language and customs. Those ties were weakened in the mid-nineteenth century when the French banned overseas voyaging. Futuna has close cultural ties with Samoa and Rotuma. With the arrival of the Catholic mission in the l830s, a long history of warfare ended. In l844, France was invited to protect the people of Wallis and Futuna under the rule of the Catholic Church. France took over political management in l888 at the insistence of Lavelua (Queen) Amelia, who wanted a French doctor to become the administrator. The French navy provided a series of administrators. The result was a tripartite administration of Wallis and Futuna. The Lavelua along with the Tui Sigave and Tuiagaifo of Alo for Futuna, all chiefly families, represented the traditional leadership; the French naval doctors, were the colonial administrators; and the bishop of the Catholic Church also exercised administrative powers. National Identity. Wallis is the dominant partner because of its larger population and the French colonial administration in Mata'utu. Despite intermarriages, Wallisians and Futunans refer to themselves as separate cultural entities. Ethnic Relations. There is a small French community in Wallis that consists mainly of administrators and secondary teachers. There are few English speakers and no Chinese community. Wallis is predominantly a rural community. All the villages are linked by road to Mata'utu. The villages surround a Catholic church where people gather at large family occasions. A program to teach building skills has led to the construction of numerous churches built with expensive imported materials. Houses are substantial, built mainly of concrete with corrugated iron roofs. A few houses of local materials, with pandanus thatch sides and thatched roofs, still exist. Houses are furnished to varying degrees, and people prefer to sit on the floor. Some cooking is done outdoors. Toilet facilities are attached to the home in newer houses. Houses are scattered have one or two acres of land that is used to grow subsistence crops. A house site may consist of four or five houses for the extended family. Futunan houses follow the Samoan fale style. The sleeping house is open-sided with a thatched roof and thatched blinds that can be let down in bad weather. There may be a concrete floor and a low wall to keep the pigs out. Cooking is done in a cook house behind the sleeping house or in an earth oven in the bush. Water and electricity were installed in 1990, though few families can afford electricity. Wallis has an urban space that contains government buildings and a shopping area. Futuna consists of a string of villages along the southern coast, of which Leava is the main center. Each village has a small shop. Food in Daily Life. Family households rely on taro, yams, and sweet potatoes. Villages on Wallis near the lagoon eat fish. If no man in the family is available, women comb the lagoon for crustaceans. Pigs and chickens are raised mainly for celebratory occasions. Families eat twice a day. Bread and coffee are the mainstays of breakfast. The evening meal consists of taro or yam and fish (on Wallis) and sometimes frozen chicken or corned beef. Tea is the most common beverage. Food Customs at Ceremonial Occasions. Every family contributes food on public occasions. Pork and turtle are feast foods, with chicken also being reserved for special occasions. Alcohol is an expected part of public feasting on Wallis, and kava is drunk by Futunan men. Basic Economy. Both Wallis and Futuna have a subsistence-based economy. The land produces taro, yams, sweet potatoes, cassava, and breadfruit. There are no sales of local foods, except to foreigners. The nuns teach cooking and how to use new foods. On Wallis working for the government and teaching are the main sources of employment. Overseas remittances from family members in New Caledonia contribute to the basic economy. Young men serving in the French military also send or bring goods home. Futunan families farm the hillsides inland and also maintain a small garden in which they grow the kava plant and bananas for daily use. Land Tenure and Property. Two types of land are distinguished; bush land and house land. Families "possess" some lands that link them to a pule and ultimately to the traditional chief. There is also land for use by members of the village. Family land rights are passed to both sons and daughters, but males bear the major responsibility for keeping the land productive. All family members are expected to work on the family land. Commercial Activities. There are minimal commercial activities. One or two importers, French by nationality, serve the purchasing requirements of the community, namely running one super market, and selling to the small stores in each village. There are no exports, other than an occasional shipment of handicrafts to New Caledonia. Electricity is provided by hydro-generation on Futuna, run by a French-based company. Major Industries. Tourism is considered essential to the economy but is dependent on irregular air links. There are two small hotels and three or four restaurants on Wallis. There are no hotels on Futuna. Trade. There are no significant exports except foods to family members in New Caledonia. Imports include hardware, building materials, vehicles, electrical wiring, and appliances. These exports come from France via New Caledonia, Australia or New Zealand. There is one supermarket, and each village has a small store run by a local family. Women make tapa for sale in New Caledonia. 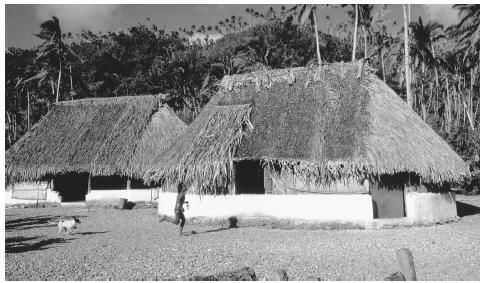 A boy and his dog run past thatch roof huts on Futuna Island, Wallis and Futuna. These huts follow the general style of Futuna homes. Division of Labor. Men and women on Wallis work together on family land. Men cultivate steep lands on Futuna, while the women remain in the village, making tapa and other handicrafts, and caring for children. Most government jobs are held by men, but women predominate in the education sector. Women produce most of the handicrafts sold in New Caledonia. Men are more prominent than women in political affairs. Classes and Castes. Traditional hierarchies exist alongside stratification by income. Classes are perhaps more pronounced on Futuna. In Wallis, the traditional hierarchy persists, with the Lavelua at the apex and the general populace referred to as commoners. A distinction exists between families with and without cash income. Remittances from family members overseas also distinguish families. The Catholic Church is the largest landowner. Families that have produced a priest or nun have a high status. Symbols of Social Stratification. Education levels are not important markers. New Caledonia has been the sole source of tertiary education until a two year post-secondary program opened up in l990. Symbols of difference include a car or truck, a large house, furniture, access to electricity, and knowledge of life in New Caledonia. Gifts to the church are important indicators of status. Government. Wallis is run jointly with Futuna as a territory of the French government. The administrator represents the French republic and heads the cabinet, which consists of the three kings and three appointed members. An operational staff of government advisors operate on a budget supplied almost entirely by France. Wallis and Futuna together elect one representative to the French Senate. The second form of local government is an elected body, the Territorial National Assembly which consists of an elected leader, and a body of elected assemblymen. This body debates finances and the issue of independence. Leadership and Political Officials. The Lavelua, Tui Sigave, and Tuiagaifo rule their geographic areas. Each is assisted by district councillors. Their area of governance includes traditional access to labor as needed and welcoming visiting dignitaries. Each village has a primary school. They are the controlling authority in people's everyday lives and issue passports. Social Problems and Control. Justice is administered by the prefect under French laws. The Lavelua and the two Futunan Tui, together with the Territorial Assembly, deal with local concerns. There is a small local police force. Military Activity. All young men serve two years in the French military when they reach eighteen years of age. Welfare is the concern of families and falls under the traditional system of local government. France funds the hospital and the medical staff as well as many secondary schools and public works. A minimal welfare system is supported by the French. A small pension is available to those over age sixty, but there are few other means of support. Trade unions have been active as workers, particularly teachers, seek better conditions. Catholic organizations include parents' groups associated with schools and a women's organization. There are links to other Catholic communities in the Pacific. A small group of health educators is supported by hospital administrators. Division of Labor by Gender. Men and women work together in the fields. Work in the home is shared among the sisters and wives of brothers, so that mothering is a joint activity. Often Grandmothers are the care takers during the day if the women of the household are employed or are drawn away from the village by church activities. Men cook outdoors, while women cook indoors. The Relative Status of Women and Men. Few women run for public office, but many women hold senior posts in government and in the community. Women's status as sisters gives them higher rank than their brothers within the family. Oldest sisters in particular are honored, but as wives, however, they are expected to be subservient to their husbands. Marriage. Marriages are controlled by the family and formalized by the church. Missionaries once raised young boys and girls apart from their families and then arranged their marriages. Today young people meet in high school, and families approve or disapprove of the friendship. Cohabitation occurs but is not approved of by the family or the church. Illegitimate children are likely to be raised by aunts and grandmothers. Domestic Unit. An extended family household is likely to consist of several houses linked by brothers and sisters and their spouses. Households change in size as young people and their children go to New Caledonia, leaving one or two children to look after the parents. When a young couple marry, they join the household of one of their families. It is rare for a new house to be built. The household usually is headed by the father or the oldest son, though occasionally the oldest sister takes this role. The extended family is the basic unit of interaction. Food and other gifts are exchanged, and children move freely between members of the extended family. A funeral draws the extended family together. 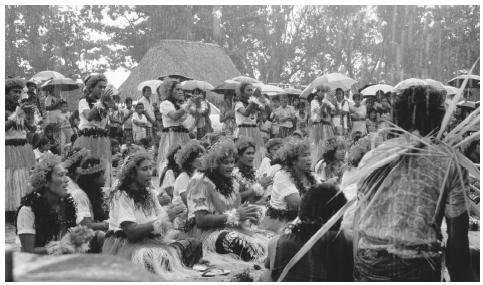 A festival on Futuna Island. The population of Futuna is approximately 5,000 people. separation over distance, such as Noumea, France, or Futuna. Kinship is traced bilaterally, with both sons and daughters inheriting rights to the land, and membership of the kinship group. One son and one daughter are expected to look after the parents, including siblings of their parents. Strong kin ties between brothers and sisters hold the extended family together. Kin terms for brother and sister also apply to cousins. Funerals are major occasions when kin make every effort to travel from Noumea or France to honor a departed relative. Similarly, kin on Wallis and Futuna will endeavor to travel to Noumea for funerals of close kin. Infant Care. Infants are welcomed as an addition to the extended family. They are cared for by a number of relatives, both old and young. Sisters and aunties look after the infant's every need, so it is rare to hear a child crying. They attend church along with the family. An infant is weaned at about one year of age by an "auntie." Child Rearing and Education. Children are raised and nurtured in an extended network of kin and are wanted and loved. They sleep alongside adults and accompany adults to the fields and to social events. Children who cry are quickly attended to. Each village has a primary school run by the state. Primary education is much desired by parents, but classes are large and attendance is irregular because children, usually girls, are expected to meet home commitments as well as get an education. Higher Education. Higher education is available in New Caledonia, France, and Australia, but graduates have difficulty finding jobs and adjusting to life back home. A two-year post secondary program was established in the islands in 1990. Respect for elders and generosity are the core principles. Oldest sisters are honored and respected. Elders hold authority in the family, and brothers are expected to look after their sisters and guard their virginity. Men and women socialize in separate groups. Children are expected to sit quietly through church or a meeting; if they become restless, they are taken outside by a young sibling. Religious Beliefs. The Catholic Church has been dominant on both islands for over 160 years. Villages are built around churches, which are maintained by the community. Religious Practitioners. Catholic priests are the church leaders, with one serving several villages in a contiguous area. Nuns are also very active serving the Catholic community, particularly as teachers, but also in a wider caring role. The Bishop of Wallis and Futuna is a leading authority figure and still plays an important role in island politics. Rituals and Holy Places. The original Catholic settlement at Lano in Hahake is still the center of Catholic society on both islands. Until about 1910, a secondary school trained future priests and nuns. Catholic feast days and holy days and first communions are part of the annual cycle of rituals. The beatification of Father Chanel in 1889 has made the basilica at Poi a special symbol of the Catholic religion. The installation of a new Lavelua or a new Tui Sigave or Tui Asoa is likely to involve a kava ceremony. Death and the Afterlife. Funerals are major extended family events that draw together mourners from Wallis and those who can afford to return from New Caledonia. Traditional medicine is practiced mainly by women, who use massage with local oils, potions made from local vegetable materials, and insertions of local plant materials into the appropriate orifices. Pregnancies are still treated largely by local health practitioners. Major villages each have a small clinic with a visiting nurse several times a week. Serious cases are referred to the central hospital on Wallis. Less serious cases on Futuna are treated in a small hospital. Victims of road accidents must be airlifted to New Caledonia or Australia. Support for the Arts. The church is an outlet for sales on Wallis and in Noumea. Men who carve sell their work in New Caledonia. Literature. Literature has been poorly developed with few attempts to record myths and legends, or history locally. This is changing as tertiary education becomes available to Wallisians and Futunans. Graphic Arts. Designs on siapo and tapa are a major art form for Wallisian and Futunan women, who use a template carved out and then applied to the beaten barkcloth. Both local and purchased dyes are used along with the traditional brown and black. Woven mats, often fringed with brightly colored wool, are used as gifts at the funerals of relatives. Performance Arts. Participation in the Pacific Arts Festivals is a high point of community involvement. Dances are revived and composed to represent the unique features of the Wallisian and Futunan cultures. The South Pacific Games are another arena in which residents compete. The sciences are poorly developed. Government officials from France bring ideas but the absence of any tertiary training center has necessitated Wallisians and Futunans to travel overseas to gain western type knowledge of the sciences. A two year college that opened in 1991 will begin to change this. 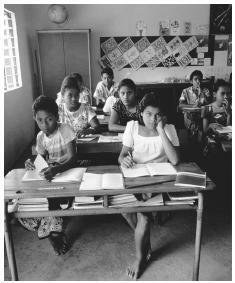 Bibliographie, Phonographie, Filmographie et Museographie des iles Wallis et Futuna , 1976. Burrows, Edwin. Ethnology of Futuna , 1936. Connell, John. Migrations, Emploi et Developpement dans le Pacifique Sud , 1985. Godard, P. Wallis et Futuna, 1976. Kirch, Patrick. "Cultural Adaptation and Ecology in West Polynesia: An Ethnoarcheological Study." Ph.D. dissertation, Yale University, 1975. Manuaud, S. Futuna, Ethnologie et Actualite, 1983. Mayer, Raymond. Deux Cent Legendes de Wallis et Futuna, 1971. Pollock, Nancy J. "Doctor Administrators on Wallis and Futuna." Journal of Pacific History 25 (1): 47–67, 1990. Poncet, Monsignor. Histoire de l'Ile Wallis, le Protectorat Francais, 1972. Rensch, Karl, ed. Tikisionalio Fakafutuna-Fakafalani, 1986. Roux, J-C. "Migration and Change in Wallisian Society" In R. T. Shand, ed., The Island States of the Pacific and Indian Oceans. Viala, M. "Les Iles Wallis et Horn." Bulletin de la Societe Neufchateloise de Geographie, vol. xxviii 1919. My husband's family is proud of their 'uvea' blood in their tongan heritage. (His generation) not much is known about Uvea, other than what has been told to them by their elders. Thanks for the history lesson, I will most certainly share this precious information (LAVELUA), as a family reunion is going to be planned. Husband's family name is VAKA/VIVILI. I am so happy to read your research about Wallis and Futuna. I am married to the oldest grandson of Fatafehi Lavelua. Fatafehi being the son of Vito Lavelua. However they settled in Tonga and some of the family is here in New Zealand. Fatafehi son Siaosi Setefano Lavelua is still alive in Auckland he is about 85 years old. Some of his half brothers are named as Kuli moe Toke etc. I am sure there is a connection to the Lavelua in Wallis and futuna. My kids would love to visit the Island sometime in the future. Hello! This is an outstanding paper. Even today it is hard to find as comprehensive material as this about Ouvea and Futuna. It's just pity it doesn't include the very current state of the isles - I am aware that in past 10 years it has changed a lot. Though I am from Czech republic (central Europe), I like to read about Ouvea and Futuna as I have a couple of friends there :-). Cheers and happy Christmas for everybody. Hello!! I am so happy to read this web page and know alot about Futuna. My mother's great grandfather is from Futuna. His name is Samuela Lawelua, but have settled in Fiji. I would love to visit Futuna some day. Thanx!! I am a Fijian with English ancestory. I also have Wallisian blood and I am proud of this heritage. I am the great great grand son of Katalina Fa'apulea. My family (Nevukia and Ahome'e) is from uvea, way back in the day. They migrated to Uiha ha'apai in Ha'apai Tonga. It interesting to read about uvea and the links between all the islands and how the the link between Tonga and Uvea was cut off. A lot of familie traveled between islands until it was banned. I remember my grandfather telling me about when we were small. They had to leave a lot of their family behind for years. But thanks for the history. Hi, Im PJ Loko (name after grandfather Palenapa Loko), Im Tongan and Uvea mo Futuna, Love Both Cultures, nOw in America (Los Angeles) and 1 day will marry an Uvea girl lol. Bringin Uvea bloodline 2 USA! The High Chief of the village (Vui Seinafolava Ma’aleale) rescued them and looked after them. I am looking for anyone who knows this story. Why did Luge and Sala leave Wallis and Futuna? It was unusual for a couple to make such a journey. Any other information will be welcome. All our family came to New Zealand, but we have some relations in Samoa, and many of the descendants of John Stowers regard us as 'cousins' which is very heart-warming. My mum father came from Ouvea his name was Helihe Koloi not a lot is knowen of the family there? still looking for storys. My mum visited in 2001 around about, with the Tokelaunen church group and she managed breifly to meet family but could not quiet manage how they were connected. And yes we have also meet a family member from New Caledonier but the family line was still unsure. We looking at 1810 , 1815 i'm just throwing it out there! He travelled to Tokelau Nukunonu to help build the church my grandfather and five other men from Ouvea. This is a beautiful site, lived on the island when i was a small boy with my parents and sister (Alice) and 2 brothers (Arthur and Joseph) speaking the dialect fluently coming over to fiji and not able to speak a word of English and now its the other way around. mY Grandfather is Tenasio Fakailoatoga and his parents are Petelo Fakailoatoga and Malia Moula Fakailoatoga. Somehow our family name changed and we now are known as Filitoga/Philitoga. I know some day i will take my family to visit the beautiful island of Wallis. I am trying to research my genealogy and came across this website which is so informative and interesting reference Uvea and Futuna Islands. My grandfather, Amato Vaivelata was from Uvea and settled in Tonga around early 1900s. So I've only known my parents originated from Tonga (bits and pieces of my Tongan heritage) migrated to Amerian Samoa where I was born along with my siblings. Now while serving in the U.S.Army for 15 years, being a mother for the first time and attending my husband's family reunion recently; it struck me that I needed to look deeper in to my family roots:) I never really understood exactly where my grandfather originated from until now. Thank you for sharing and I'm looking forward to find more information on my Uvean heritage, family name/history and I do plan to visit there one day soon! If anyone has any information on my grandfather or his parents please email me at mspakileata@yahoo.com. Thanks in advance and God bless! Thank you for the educational information on your site on Wallis/Uvea and Futuna. My paternal grandmother came from Uvea with her mother and brother to FJ in either eighteen or early nineteen hundred. My grandmother died before I was born but I knew my great grandmother, whom I loved dearly and have fond memories of our time together. Her name was Malia Tukanoa( I think that's how it's spelt, and her daughters name was Sapeta Fenualelei. Proud to be!! !..I am a grand-child of Samuela Lawelua. Futuna blood running through my vein...loving it. Malo si i Kataki & Bula, Thanks for this great article summarizing Wallis & Futuna for all, especially for Wallis & Futuna descendants who live in English speaking Fiji. There are a few things I thought were under represented which particularly distinguish Wallis & Futuna Islanders from their Pacific neighbors: Veneration of their St. Peter Chanel, The bright & colorful Mats-Wallis, finely wieved white mats-Futuna and the inspiring Wallis & Futuna Soa'mako especially the Futuna version. I also thought that the Wallis & Futuna's contribution to the spread of Catholicism in the South Pacific should have been part of the article as this was how Wallis & Futuna descendants came to be in Fiji, Rotuma, Tokelau & Samoa ie apart from those who settled in pre-European times. am a descendant of Samuela Lawelua and Pelasio Sogia. Hi, my name is Kalolo Fifita, my grand father was Havea Loko and i'm from Tonga lived in Australia and i'm looking for the Loko family from 'Uvea, i heard most have move to New Caledonia. I will be in NC in August for the Pacific Games and would love to meet any of them. 'Ofa atu kia kimoutolu. Hey Kalolo. Do you live in Canberra? Last time I checked this site was over a year ago and now - amazing it's got our bretheran.As a genealogist of 18 years and I linked up with the Catholic Church around 1993 about James Cooper Haal (the correct spelling). All I have to say is thank you so much everyone - and I am proud of all of you and you who know me over the time. My research is there should be some type of reunion in one form or another as a Cooper Haal descendant myself - there are things that only chiefs know and for myself I have evidence of the history connected to Uvea and to cut a long story short we Cooper Haal's are all chiefs if you come to my land. I love you all - even you Georges Pilioko of Uvea. Be proud of who and what you are everybody and as we say in Maori in New Zealand - kia kaha (stay or stand strong)! I have never been to Wallis island but have been to Ouvea off New Caledonia. I belong to an archaeological club here in Brisbane and am very interested in the history of Ouvea. Your introduction named it 'West Uvea'. I know it has a Wallis island and Tongan heritage as well as Melanisian's from New Caledonia. I would be pleased if anyone has any information on it's history and are willing to share it. My name is Jim Wakefield and I am interested in the history of Ouvea and Tonga. No matter how uninportent the story is I would very much like to hear about it. hi my name is nadine philitoga i am 13 years of age and i'm in form 3 in gospel high school ... daughter of alma and ronald philitoga i live in fiji and i'm from wallis and futuna.. my grandparents are finau filitoga and michael philitoga.. i really like this pg it is very interesting and it also helps me in my projects alot.. someday i hope i could visit wallis and futuna with my family. proud 2 be a wallisian..
Thankyou for this informative site. I plan to travel to Wallis et Futuna next year as a spectator for the South Pacific mini games. Any advice regarding accomadation would be appreciated. my great great grandfather was Petelo STOWERS son of Englishman John STOWERS who settled and died in Lano Savaii is there a connection ? Responding back to Malia..can you please contact me in hotmail seinitaufa1@hotmail.com about the whole story nd if you have photos of them it will be very grateful..Thank you and i'm also a descendant of them too. Nice and informative page, though I have a relation to this area only based on couriosity. I am working on a childrens book - small poems about children i different countries. Hello, I am trying to trace my dads mothers family in Uvea. My grandmother Sapeta Fenualelei migrated to Fiji with her mother and brother in the early 1900 I think. All my ancestors from that side are now deceased. (All our elders from my dads mothers side.) I would dearly love to know where she came. Sapetas Mothers name was Malia Moamoa and her fathers name we were told was "Maui" Apparently his wife and children went to Fiji after Maui was killed. Malia married a Fijian man to enable her to travel to Fiji with her two children. I would dearly love to do a family tree of my name sake. I love my wallisian family and I am very proud of the culture, especially our faith. I remember my great grandmother praying and reciting her rosary beads. Teaching me the importance of our faith and culture. My grandmothers grandfather Sandy Bulsey(earlier knownas Sandy Futuna) arrived here in Australia in the Blackbirding (slaverey) era. I think he was a free man & was allowed to stay in Australia after passing a government process,details are sketchy. Does anyone know of any records of Futuna islanders traveling toAustralia during the early part of the century. I lived in Sydney and my Mum is from the Havea family from Vava'u , she is still alive turning 80 very soon . She is an albino and her father was an 'Uvean .Would love to hear more about their relatives and the history of their family. Malo te mauli.. replying to kalolos post. .our havea family is from Vavau too..my father is Lotoa Havea..they lived in falaleu but they were brought up in Mangia in Vavau. .my dad has been telling us about our Uvean family history. ..I'll be going to uvea/wallis in september to play volleyball there m find more about the havea family history. Hi, so great to read about relatives' passion for roots. My name is Bella Kasiano, I've been told that my grandfather's from Wallis/Futuna by the name Soane Kasiano. I am trying to do my father side family history, but it is really hard to find where all his family are. I will appreciate if anyone or anybody know anything about SOANE KASIANO, I would love to hear from you.. Here is my email address b.leaupepe@hotmail.com for any information that required. Just asking if you have any information's about James cooper haal and family because im a descendant of him though. I really want to know things about him and the faily but I just don't know where to get information. If you have informations about him and the family, Please tap back when you can. Am proud to be a Wallisian. My father's name is Tomasi Maivai which somehow or other changed to Thomas Walter. My father is from Wallis and is the son of Sililo and Sulia. My father's siblings are Malia, Soane and Aloi. My father lived at Villa Maria, married a lady from Bua Village and had two children Julia and Peni. My father's elder sister, Malia (msrried a Futunian who goes by the name Motoka) had Maleta, Patrick, Resina, Sisilia and Losa. Soane (married an Indian lady) had Monica, Christopher and Loreta. Am sorry to say that my father and his siblings has all passed away.So far only Me (Julia)brother Peni, Losa, Monica, Chris and Loreta are the only living descendants of Sililo and Sulia sorry not so sure about the surname of my grandparents. I would be very happy to know more about my relatives on the Islnd. Thanx for this wonderful page. The above Email address is the correct one and not juliawalter@yahoo.com. Well keep your chins up, Relatives,friends and everyone connected to Wallis and Futuna. Good luck to all and God Bless. Hello everyone, I'm Wallis and Futuna and I live in New Caledonia. My grand mother of Rotuma and all her life she lived in Wallis and Futuna som name is Lotana Muni Saga Samoa was married to my grandfather who was called Efelemo Lose Filimohahau if anyone can help me find her family thank you at all. I'm glad that this article was interesting for you because I'm from Wallis and Futuna and normally nobody knows us. If you have any questions, ask me, there's no problem. I can help you but you must know that I read some comments and some last names are really similar to our last names too. Filitoga/ Lavelua : That's the wallisian spelling.. The PH doesn't exist even the w in WF. my Father grand dad is AloAloisio who came to Tuvalu and married to a Woman from Vaitupu... well AloAloisio was the son of Filipo the grandson of the Tui' Agaifo of Alo name Niuliki back in the 18 century .. my dad Ioane drift from Tuvalu to Futuna around the year 1989 and that how we reconnected with the family back in Futuna again and on his returned to Tuvalu he brought us great story of the family back in Futuna and I hope one day I'll visit the Island of Futuna too see it with my own eyes.. lately one of my cuzz Siliako Alofi visited Futuna lately but hell yeah I'll would love to visit myself and meet the family back home..
Hi my name is Maria Rosa Bulavakarua. My great great great grand father is actually originally from Futuna. We have been raised up in Fiji but I'm always proud to be wallisian blood. Hi Polani, great to learn of this page. I am named after my great grandfather - Moses Filimoealiki Tongare from Uvea. I am trying to learn a little about him and the reasons for his departure which landed him on Tikopia (a polynesian outlyer in Solomon Islands) and trace my Uvean bloodline ... any info to assist me in this quest is very much appreciated. Hope you will assist. Many thanks. Great page. I'd like to expand on Samuela Lavelua's (originally Lavelua) extended connections and legacy in Northern Fiji. He later settled in Naqelelevu an atoll North of Taveuni with wife from Laucala Island, Filomena Tuivucilevu. Futunans are known to sail to and from Naqelevu, Laucala and Qamea Islands regularly and traded in the late 1600-1800s. Ma'afu a Tongan general was building a reputation in Northern Fiji and his power was growing rapidly. Lavelua was a seafarer/trader and had a flotilla of canoes ( lead by his rig 'Sa'uela' ) that sailed from Futuna to Fiji on his final voyage to Fiji mid 1800. Samu helped the Laucala Island Chief Ro O'Talo'o develop one of the strongest canoe fleets in Laucala Island, Taveuni Fiji. Tui Cakau a great chief of Northern Fiji, enlisted his service and appointed him his maritime advisor. Samu was over seven feet tall as well as most of his warriors and coconut planters. As a trader he sailed the coast of Vanua Levu during the Beech de mer and sandalwood trade era and spent some time trading in Bua ( Northwestern Fiji) where the Tongans had influence. Samu often sailed the Northern coastal waters of Vanua Levu from Galoa Island, Cikobia, Qelelevu, Laucala, Vanua Balavu, Nairai and the Central Fijian waters. It was Lavelua's trading domain where he traded and built a reputation for being a warrior, builder, planter and sometimes a pirate ( raided foreign vessels). In Northern waters of Vanua Levu, this scheme was used by Tui Cakau as deterrent tactic to compel any potential adversary to Tui Cakau (particularly the Tongans) from attempting an invasion; Tui Cakau meanwhile, was struggling to rule the North-eastern domains of Fiji. In exchange for Samu's maritime advisory service, he was appointed as maritime warfare advisor to Tui Cakau. He lived on Vuniduva, chiefly village of the Tui Cakau in Taveuni. After the successful defeat of the Tongan Invasion of Wairiki around 1858-1860, (by Tongan Lieutenant Wainiqolo who had strayed from Ma'afu's outfit), Lavelua retired and occasioned Laucala and Naqelelevu. Lavelua's influence as a builder and seafarer saw him modernising one of most successful maritime fleet of canoes from Laucala Island (Now Laucala Resort), the 'Vuanicau Fleet', which conducted an amphibious block of the Tongan land invasion of Wairiki and the eventual saving of Tui Cakau from being imprisoned by the Tongan invaders. Northern Fiji was freed from Tongan interference. Lavelua's legacy lives on in Cakaudrove (Takounove known by Tongan). He abandoned his service to Tui Cakau as Palagi influence began evidently misleading to ( the newly installed) Tui Cakau and returned to Naqelelevu with Adi Filo and lived there until the early 1900s. Samu's daughter Luisa Tevu'ulu ( daughter of Mere Qumu from Galoa Island) travelled with his father Samu and lived in Laucala and eventually Olosega ( Samu's village on Qamea Is) and married Tadeo and settled on Olosega and Togo, Qamea Island, Fiji. Samu Lawelua's burial site is on Naqelevu Island, which lies immediately North of Qamea. Malo ni. My name is Mahina, I'm Tokelauan(Palehau), half Uvea(Ha Hiolisio) and Portuguese(Perez). Grew up in Tokelau knowing my nena has family in Wallis and Tonga. Hi everyone, I’m a costume design student and for my thesis i need some information about traditional costume in 1800-1850 In Futuna island, specially the king, and warriors. If you have any information and photos,it would be very kind of you and a great help to mail me the information. Hello Uvea family - I am also a descendant of Malia and James Cooper-Haal's daughter Veisinia Nganongano 'i Fale who married Lafaele Sisivaivai/Sisitoutai (Saimone Lino). I would love to connect with family to share information. Please feel free to email me to connect.